We’ve finally made it to December and the holiday hullabaloo is in full swing! Between the family photos, mailing holiday card, scheduling the holiday shows, concerts, and parties, gift shopping…and oh yeah, we still have our regular daily lives to manage…Screech! Pause…slow down and breathe. How are you finding yourself being present with your kiddos and with your loved ones? Are you taking a break from anticipating the future, while also not dwelling on the past? Enjoying the present-moment, right here, right now? I know I have already caught myself floating down the holiday rabbit hole trying to brainstorm the newest and best gifts for kids these days, which holiday parties we want to attend and planning ahead as family schedules their travel plans. Meanwhile, we’re attempting to make time to enjoy the process of decorating EVERYTHING while not getting too caught up anticipating what needs to be done. Happy Holidays…right? Once again…hit the brakes! And breathe. The holiday season truly is one of the most wonderful times of the year! It is a season of giving, a time to come together, and a chance to fill your soul with warmth and joy no matter what the weather is doing outside. Yet, it can also be a time of year where you find your stress, worry, and anticipation heightened, when your emotional and mental health and wellness are taking a toll as you dance around from one thing to the next. 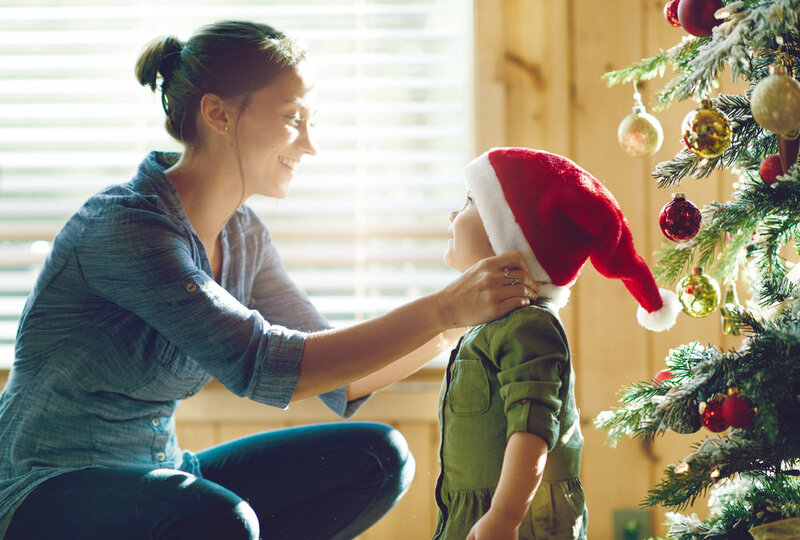 What if we gifted ourselves, our kiddos, and our loved ones with our presence this holiday season? And, I don’t mean, showing up to dinner and socializing while everyone is still immersed in their phones and cool new electronics! I mean, are we really wholly…whole-heartedly present in mind, body, and spirit if our mind is absent and somewhere else? Are we embracing the true meaning of the holiday season to fill our hearts and souls with warmth, love, cheer, and joy if we aren’t present? What holds more value for you: presents or presence? As we all find ourselves immersed in the holiday season, I hope that you and your family can experience and enjoy the gift of each other’s presence, a priceless and very special and unique gift! And, when you find yourself spinning out of control, potentially skidding out of control while hitting the black-ice patch of planning and anticipating the tangible gifts and events that blitz us during this busy time of year, take a moment to breathe and ground yourself in the present-moment that is right here, right now. Below in the comments, I’d love to hear how you find yourself being present with your kiddos and your loved ones. What priceless gifts do you receive from being present with your family this holiday season? Happy Holidays to you and your family from all of us at The Groove! Thank you! Here’s your Daily Debrief!